This Spring Summer it’s all about strong and vibrant colours, such as plums, pinks and anything in between, which is why I love the shades in the brand new Korres collection. The range has some fantastic colours that are really on-trend, like this divine watermelon shade, their coral pink or the pomegranate. But it’s not just the colour, their texture is creamy and solid so they look great and last for ages without chipping. The best thing about them, however, is that not only do they look fantastic, they are actually good for your nails too. Yes, you read correctly! This natural approach fits into the Greek brand’s philosophy, which is all about wellbeing and natural beauty, and focuses on bright colours with high shine that have been developed with mild solvents and a unique nail formula. It contains Myrrh extract and Provitamin B5 and a mix of five essential good-nail-health nutrients (silicum, calcium, zinc, iron and sulfur) to moisturise and strengthen your nails. And, of course, the formula doesnt’ contain any toxic ingredients. The Korres range has twenty colours, a base coat and a top coat, and it’s really impressive. I strongly recommend that you check it out for yourself and wave goodbye to the days where varnish ruined your nails. 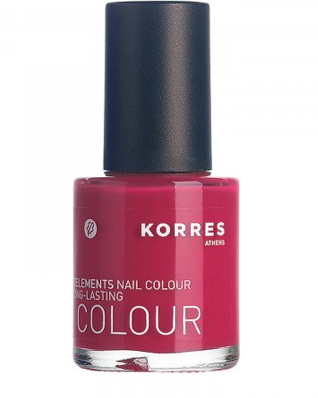 Korres nail varnish is priced at £9.00, and is available from John Bell & Croyden in store at 50-54 Wigmore Street, London W1A 2AU or online at Johnbellcoryden.co.uk. This entry was posted in Make Up, Nails and tagged free from nasties, healthy, holistic, Korres, nail varnish, Watermelon. Bookmark the permalink. Love this Colour, and this post!